I began producing our “Peter Franus Napa Valley Zinfandel” in 2002 to allow me more blending flexibility in the creation of this wine. Rather than highlight a particular vineyard identity, the plan was to create a style of wine that was more immediately approachable and easy going. The vineyard sources have varied somewhat from year to year, but the goal is always the same--to provide a good value, balanced, and delicious wine in a world of Zinfandel that often delivers the opposite. Several years ago I was fortunate to get to know, Mark Neal. Jack Neal and Son has been farming some of the top vineyards in Napa Valley for decades, and is one of the oldest and most respected vineyard management companies in the valley. And the Neals also just happen to own a Zinfandel vineyard in the prime growing area of Rutherford known for some of the most highly touted Cabernet Sauvignon in Napa Valley. Would I be interested? And by the way the Zinfandel is certified organic. The answer was obvious. A splash of Mourvèdre and Syrah from Jim Fore’s fabulous vineyard on Cobb Mountain, add a bit of spice and complexity to complement the blend. We were rewarded with another outstanding vintage in 2014. Sunshine and a warm dry spring gave way to mild and ideal growing conditions throughout the summer. An uneventful growing season without extremes for me typically indicates a potentially excellent quality. Indeed, that was the case. Harvest began early, August 29, and finished early, October 2, avoiding the potentially cool and rainy autumn conditions. There’s a bit of buzz these days of about those returning to balance in their wines. 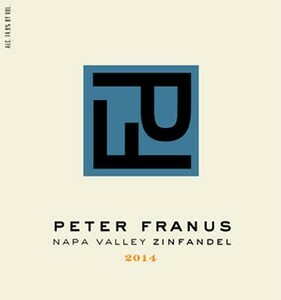 We have to smile—restraint and balance have been the hallmarks of Peter Franus wines for years, even with his Zinfandels!